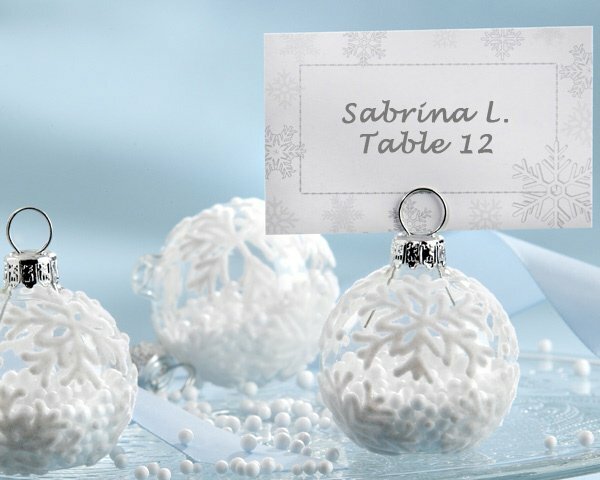 Transform your event tables into a snow-covered wonderland with these delicate glass ornament place card holders. Perfect for your winter wedding or holiday party, these 2" by 1" glass ornaments feature white flocked snowflakes on the outside, and "drifting snow" on the inside. After your event, these ornaments are perfect for holding a photo of the special occasion. 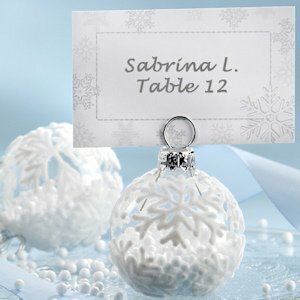 Sold in a set of 6, matching place cards are included. I would like to get these ornaments card holders for my wedding. I’m not on how to order them. It says sets of 6, does that mean it’s 6 per 1 quantity? I have roughly 150 guests. Do I add 25 on the cart? Yes, exactly - if you want 150 total, you'd enter 25 to receive 25 sets of 6.